Join us for an afternoon of food and fun. 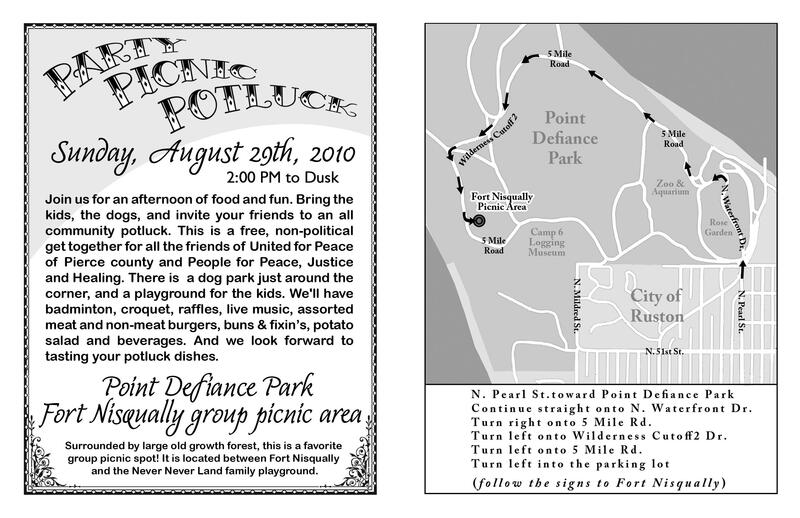 Bring the kids and the dogs and invite your friends to an all-community potluck. This is a free, non-political get-together for all the friends of United for Peace of Pierce County and People for Peace, Justice, and Healing. THE FOOD AND THE FUN! There's a dog park just around the corner, and a playground for kids. We'll have badminton, croquet, raffles, live music, assorted meat and non-meat burgers, buns, & fixin's, potato salad, and beverages. And we look forward to tasting your potluck dishes. Surrounded by large old growth forest, this is a favorite group picnic spot! It's located between Fort Nisqually and the Never Never Land family playground.